Whether you’ve been sewing your entire life or you’re new to the trade, a sewing machine is vital to your success. With so many different brands and styles to choose from, it can be challenging to find the best machine for your specific needs. 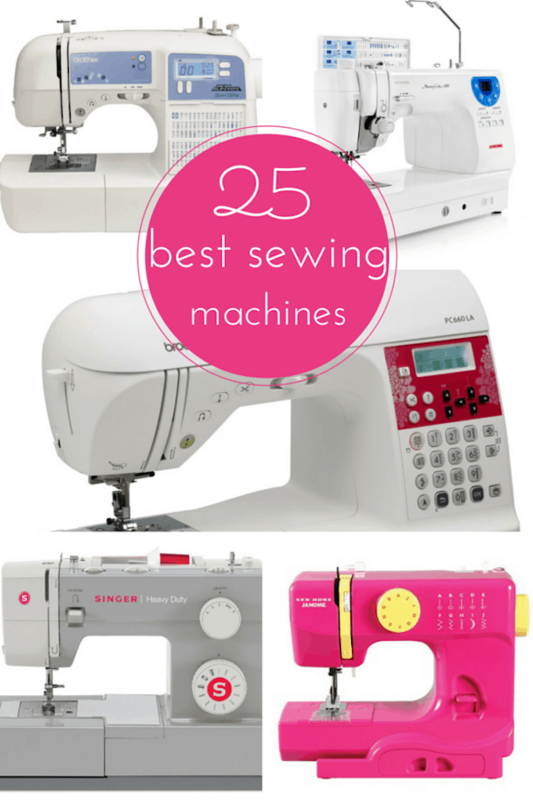 Here, we’ve scoured hundreds of machines and are revealing the top 25 sewing machines of varying prices and for varying skill levels. Perhaps you want to pick up sewing because you’re having a baby and would love to make the crib bedding, outfits and bibs. Or maybe you want to make quilts and sell them on eBay for extra income. Whatever your reasoning, sewing can be a wonderful hobby or extra source of income. The SINGER 4411 sewing machine wins for being budget-friendly, easy to use and is heavy-duty, meaning it can sew just about anything you want it to. Features include 11 different stitch options, including six basic stitches, four decorative stitches and one buttonhole stitch, a top drop-in bobbin, free-motion sewing, extra-high sewing speed and more. Whether you’re hoping to simply hem jeans or make your own purses and pillows, this machine can do it all for an affordable, practical price. “Buying your first machine? Make it THIS ONE,” states one reviewer of the Brother CS6000i sewing machine. Complete with 60 different stitches, seven styles of buttonholes, a quilting table and other accessories, this machine is perfect for a wide variety of sewing projects. With a 25-year limited warranty and free phone support for the life of the machine, the Brother CS6000i is a value-packed, affordable machine for those just beginning. The Janome 2212 sewing machine is ideal for beginner quilters. It’s affordable, it’s not complicated to learn and it’s built to last. You can use it to quilt through ten layers of fabric, hem thick jeans or just fix a hole in a t-shirt. Features include 12 built-in stitches, a four-step buttonhole, easy stitch width and length adjustments, a turn dial pattern selection and more. Uncomplicated, easy to use and both a sewing machine and an embroidery machine, the Janome Magnolia 7318 is built for life, not just for learning. The machine has 18 different stitches to choose from, a top-loading jam-proof bobbin system and a 7-piece feed dog for precision fabric control. If you’re a beginner that hopes to be sewing within minutes of taking your machine out of the package, this is the machine for you. Voted the number one sewing machine by Best Reviews Guide, the SINGER 7258 stylist award-winning 100-stitch computerized sewing machine is perfect for both beginners and advanced sewers. Complete with a DVD tutorial and five-minute quick start guide, you can be ready to sew in as little as five minutes. Additional features include automatic bobbin winding, top loading jam-proof bobbin system, automatic presser foot pressure, a six-segment feeding system and 13 different needle positions. The Brother LS2125i sewing machine is an affordable, everyday sewing machine with 10 stitches and a four-step auto buttonhole. It’s lightweight and portable, making it perfect for the sewer that’s on-the-go. The machine is easy to learn and features include an easy stitch selector dial, upper thread tension control dial, easy threading, easy bobbin winding and more. The Laura Ashley limited edition CX155LA by Brother can be used by beginners but is also a great machine for the expert sewer. It includes 155 built-in stitches, 11 sewing and quilting feet, a full set of designer accessories, an extra-wide table for quilting projects and easy threading of both top thread and bobbin. The machine was built to last, so if you’re just starting out but are planning on turning this into a long-term hobby or side job, the Laura Ashley will meet your needs. The Brother XL2600I is perfect for novices just beginning their journey to sewing. At less than $100, the machine is both affordable and versatile. This free-arm sewing machine is equipped with dozens of features—including 25 built-in stitches, a needle threader and cutter, jam-resistant top drop-in bobbin, easy stitch selector by turning a dial and more. While these machines can be used for beginners, they are often chosen by serious sewers who already know they have a passion for sewing. If this sounds like you, one of these versatile machines should suit you well. The Brother XR9500PRW limited edition project runway sewing machine does it all—from monogramming to quilting and more. Complete with 100 built-in stitches, a quilting table and a built in sewing font for basic monogramming, this machine is perfect for the crafter looking for variety. Features include large back-lit LCD screen, decorative and heirloom stitches, super easy bobbin winding system, a full assortment of accessories and more. The SINGER 4423 is a heavy-duty sewing machine that can tackle any project, big or small. The motor is incredibly powerful, the sewing speed goes at 1,110 stitches per minute and the interior frame is made of heavy-duty metal. Features include automatic needle threader, a stainless steel bedplate, a limited 25-year warranty, 23 built-in stitches and more. The SINGER 9980 computerized sewing machine has it all—including 820 stitches, 13 presser feet, a large LCD screen, a built-in sewing sewer assistance to make sure all your projects turn out perfect, an automatic thread cutter and more. You can create personalized designs and patterns by simply saving and editing your preferred stitching combinations. Whether you’re looking to sew, quilt or embroider, this machine does it all seamlessly. A step above the Laura Ashley CX155LA is the Laura Ashley PC660LA, a limited addition computerized sewing and quilting machine. Features include 303 built-in stitches, three built-in sewing fonts, 14 specialty sewing and quilting feet, plus you can create your own personalized stitch patterns for more advanced projects. The Brother XM2701 sewing machine is lightweight and versatile. At just under $100, this machine is perfect for sewers of varying skill levels. Features include 27 built-in stitches, six sewing feet, a brightly lit LED work area, an instructional DVD and more! The product also comes with a 25-year limited warranty and free technical support for the life of the product. If you’re looking for a commercial-grade sewing machine, take a look at the SINGER CG590 commercial sewing machine. Professionalism means quality and speed, and this machine does both by sewing an impressive 1,100 stitches per minute. Features include a stainless steel bed plate, 18 built-in stitches, electronic foot control, an automatic needle threader and more. The Brother PQ1500S is a high-speed quilting and sewing machine designed with the serious sewer in mind. Able to sew up to 1,500 stitches per minute, this is one of the fastest machines on the market. Other features include a built-in automatic needle threader, retractable drop feed dog control, a bed extension table for quilting and a knee lifter for quilting. Old-fashioned embroidery involves using a hoop and needle to create monograms or images. Advanced embroidery is using an embroidery machine to create professional looking monograms, images and designs. You can use an embroidery machine to personalize your child’s wardrobe, make a logo for your business or other businesses, personalize towels and baby items to give as gifts and more. The Brother PE770 is an embroidery-only machine with virtually unlimited design options. Features include built-in memory, USB port, six lettering fonts, 136 built-in designs, an LCD display screen to view your designs and more. The machine also fits a 5 x 7 hoop which allows for a wider range of designs. The top thread and bobbin can be threaded easily, making the machine ideal for beginners or seasoned pros. 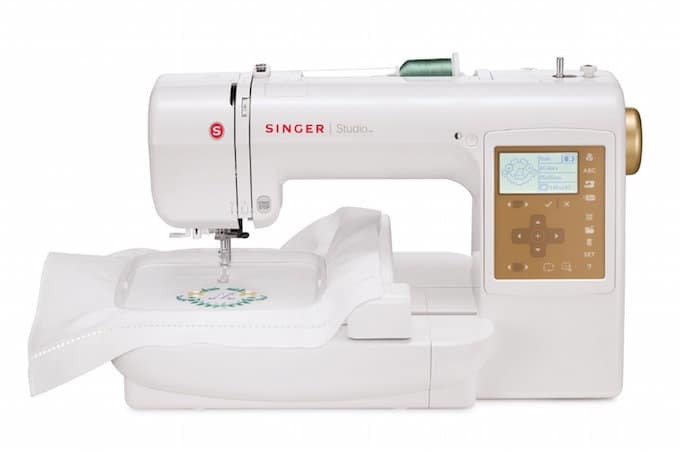 The SINGER S10 Studio allows you to embroider as you please without the use of a computer. The machine has a built-in computer allowing you to easily and seamlessly create unique monograms and décor items. Features include 55 embroidery designs, two embroidery hoops, three built-in lettering fonts, 18 built-in border patterns and more. More affordable than the Brother PE770 is the Brother SE400. This advanced embroidery machine features 67 built-in stitches, 70 built-in designs and five lettering fonts. The machine allows you to work with a 4 x 4 hoop for creating comprehensive embroidery projects. If you need a machine with a bigger hoop, the Brother PE770 would be for you. If not, the SE400 will suit your needs perfectly. If you’re specifically looking for machines that specialize in quilting, look no further. We found the best sewing machines for quilting at varying prices to match both your budget and your needs. The Brother XR3774 sewing and quilting machine is top-notch for both beginner and advanced quilters. It’s easy-to-use and packed with value, making it the perfect machine for all your sewing and quilting projects. Complete with 37 different stitches, a wide table for quilting, eight sewing feet and a brightly lit LED work area, this machine is packed with user-friendly features. For heavy-duty, professional quilters, no machine matches the Janome MC-6300P computerized quilting sewing machine. Features include 66 stitches and four buttonholes, an LED display area, an automatic thread cutter, an extension cable, sewing speeds up to 1,000 stitches per minute, five different blanket stitches and more. Designed with the serious sewer in mind, this machine will not disappoint. The SINGER 7469Q is one of the best computerized quilting machines available. Known as the “confidence quilter,” this machine can tackle any quilt—no matter the size or thickness of material. Whether you’re a new quilter or have been quilting your entire life, this machine will take your quilting to the next level. 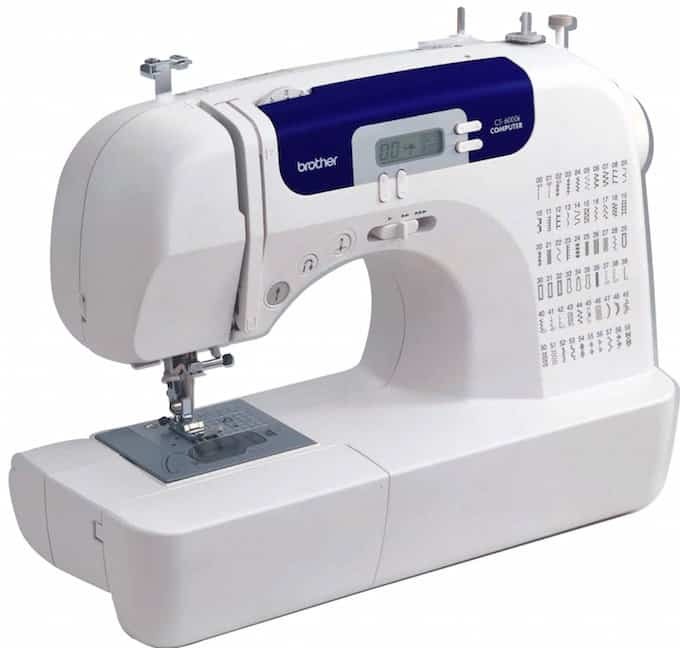 Features include an automatic needle threader, a 25-year limited warranty, an extension table, drop and sew bobbin system, and adjustable stitch length and width. The Juki HZL-G110 sewing and quilting machine includes 180 stitches with one font, bright LED lights, 37 needle positions, speed control and more. This machine will make quilting not only fun—but easy! Users agree that it’s a solid machine that lasts for years and years. If you need to sew on-the-go, you’ll need a machine that’s not only reliable but one that’s also easily transportable. Perhaps you spend weekends at your lake house or enjoying crafting at a friend’s house. If so, you should purchase a sewing machine that was made to be moved. The Janome Jem Gold Plus portable sewing machine is portable and rich in features including 12 different stitches, a four-step buttonhole, a one-hand thread cutter and a Light Serging System (LSS) that allows you to trim and complete seams in one simple step. At just under 15 pounds, this sewing machine is lightweight and straight-forward, making it perfect for beginners and advanced sewers alike. At just under $50, the Michley Lil’ Sew & Sew LSS-505 portable sewing machine includes an electrical scissors and a 100-piece sewing kit. Perfect for sewing on-the-go, this multi-purpose machine isn’t just for hemming clothes or stitching a hole. Features include eight built-in stitch patterns, forward and reverse sewing, a foot pedal, a thread cutter and more. Finally, if you simply need a sewing machine that you can use when you travel to fix clothing or garments, look no further than the Janome Fast Lane portable sewing machine. Available in a variety of colors, the machine is lightweight and portable, has 10 different stitch options, two needle positions and free arm sewing capabilities. While the machine can tackle most projects, we think it’s best for smaller tasks as it weighs just five pounds—making it perfect for bringing with you on trips or visiting family. “SINGER 4411 Heavy Duty sewing machine” is very good sewing machine! It seems that it will become my favorite! It looks durable. It sew any speed you want because of the pedal, but the pedal cable is not long enough, an pedal is small and light. But it sews and looks professional and very good! Last week i have bought BROTHER CS6000I SEWING MACHINE. This is so easy to work.Valuable site, where did u come up with the information in this posting? Wow…great review. Very good post. I really like this. Thanks for sharing!